A new fireworks factory approved for development in Għarb will be just a few hundred metres from residents, the local council has said, insisting it will file an appeal. In a statement yesterday, the council said the approval of the factory was “emblematic of abuse of power” and not only went against efforts to improve Għarb’s natural environment but posed a risk to residents. The fireworks factory is earmarked for Triq San Dimitri, in the Għarb countryside. The council has long been fighting the issue of fireworks factories in the locality. In 2010 it held a local referendum on the matter, with 60 per cent of residents voting against the introduction of more “deadly factories”. Residents have complained that the locality already hosts a number of fireworks factories and say that the development of another one could pose a threat to the environment. They have also raised concerns about its proximity – some 300 metres – to the recently restored San Dimitri chapel. The local council accused the Planning Authority of being inconsistent. “The Planning Authority, which in past years approved development permits so that the local council could improve the built and natural environment by restoring rubble walls, valleys and the San Dimitri chapel through EU funds and also which only a couple of weeks ago recognised the restoration of the chapel during the Malta Architect Awards, has now approved yet another totally new fireworks factory less than 300 metres from the chapel,” the council said. “The will of the people is not given any weight, except during the general election campaign. “The government chooses what and whom to listen to,” the council said. The PA, it added, had ignored concerns raised by the Superintendence of Cultural Heritage, which warned of the implications of the development for the San Dimitri chapel and its environmental impact. Conservation NGOs Din l-Art Ħelwa, Nature Trust and Wirt Għawdex objected to the proposal in separate representations. In its statement, the council questioned why the application had been approved by the three-person Planning Commission rather than the 14-member Planning Board. 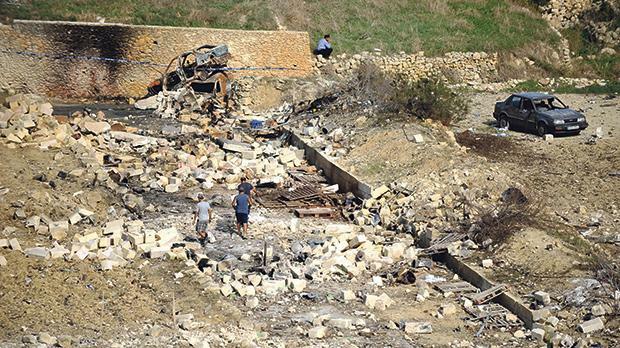 The Environment and Res-ources Authority, the council said, had pointed out that apart from the loss of virgin land, the village of Għarb was “already burdened with multiple fireworks factories”. The council said that this was “another case where the negative effect of the separation of the environment and planning authorities can be clearly felt”.